How do I sit down and write about a movie -- a touchy, heart-warming story about a dog and his undying loyalty and faithfulness for his master whom he loved with all his heart until he breathed his last -- when deep down, I am myself feeling an overwhelming sense of loss after having lost my four-legged friend Tiger to an accident? I just want to close my eyes and let all the thoughts the movie evoked within me turn inside my head, one after another like waves crashing on the shore. This movie shouldn't have ended. 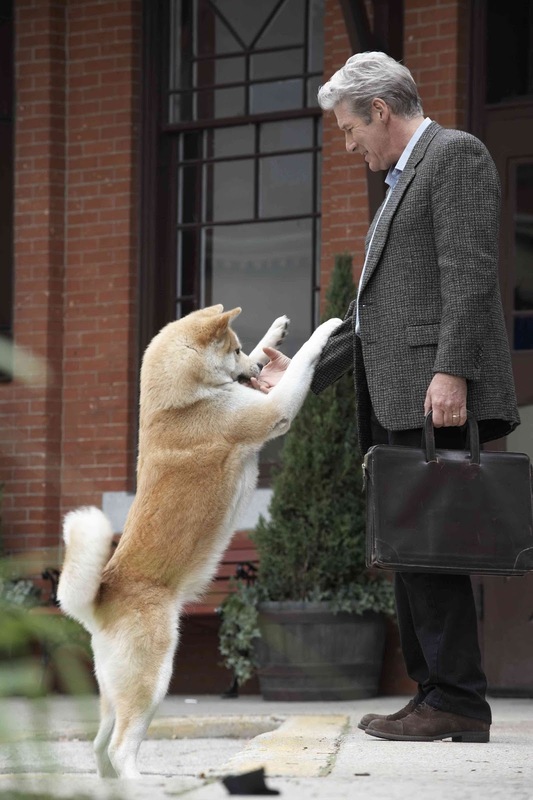 I want to see more of Hachi and his bonding with his master Parker, both of them walking together from their home to the railway station and again back from the station to their home. I wish that could continue on and on. I wish they were never separated. Some stories, however, don't always end where they were intended to. Loyal, trustworthy and very loving - a dog is always so comforting as a companion. When the master is in pain, so is the dog, trying to lick the tears away or wagging his/her tail playfully. There is probably no one better than a dog when it comes to selfless love, they are such considerate creatures of God who know only how to love. They will keep on loving their master until their last breath. Perhaps a dog knows that he/she won't live a long life and so he/she does his/her best to keep his/her master happy, with his/her undying love... all through his/her life. Based on a true story from Japan, the movie is about an Akita breed puppy, who has been transported from Japan to the US, but his cage falls off the baggage cart at an American train station, where he is found by a music professor Parker Wilson (Richard Gere). 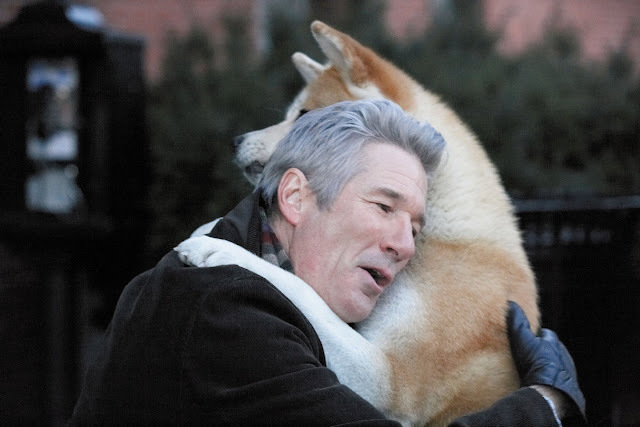 I don't know why but as Parker (Richard Gere) picks up the puppy into his arms and says "Hey buddy... Are you lost?" to the the puppy, I felt such a strong sense of deja vu! Parker decides to take the cute, homeless puppy to his home. Though initially his wife isn't interested to keep the puppy, but seeing a deep bond forming between her husband and Hachi (the dog), she relents. Parker, however, is still mystified by Hachi's refusal to do normal, dog-like things like "chasing and fetching the ball". Then starts a new routine... Hachi following Parker to the railway station every morning when he leaves for work and then returning back home after Parker's safe departure, amd again coming back to the station in the afternoon to see his master's train arrive and walk with him home again. This continues for some time, until one afternoon when Parker calls Hachi to walk to the station while leaving for work, but Hachi barks and refuses to go with him. Parker eventually leaves without him, but Hachi chases him, holding his ball. Parker is surprised but pleased that Hachi is finally willing to play "fetch the ball" with him. Prof. Parker leaves on the train despite Hachi barking at him. But while giving lecture at the college that day, Parker, still holding Hachi's ball, suddenly suffers a heart attack and dies. 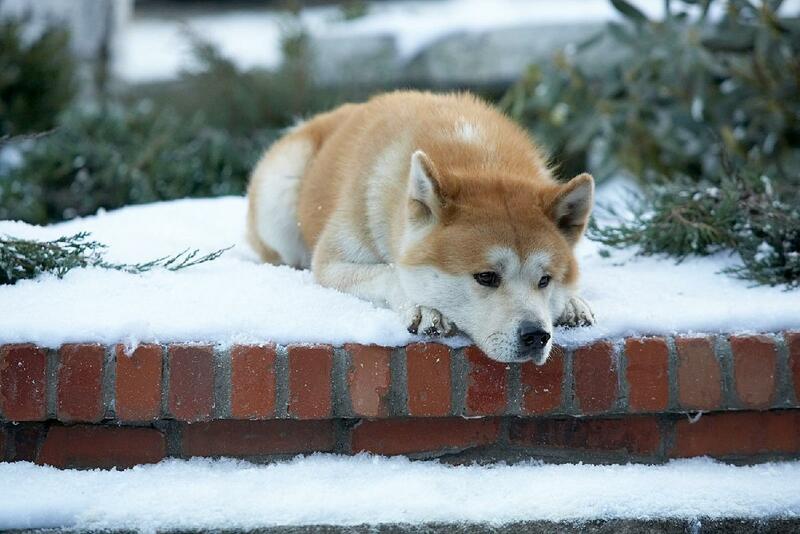 At the train station, Hachi waits patiently as the train arrives, but doesn't find Parker. He remains, lying in the snow, for several hours, until Parker's son-in-law Michael comes to collect him. The next day, Hachi returns again to the station and waits, remaining all day and all night for his master Parker. 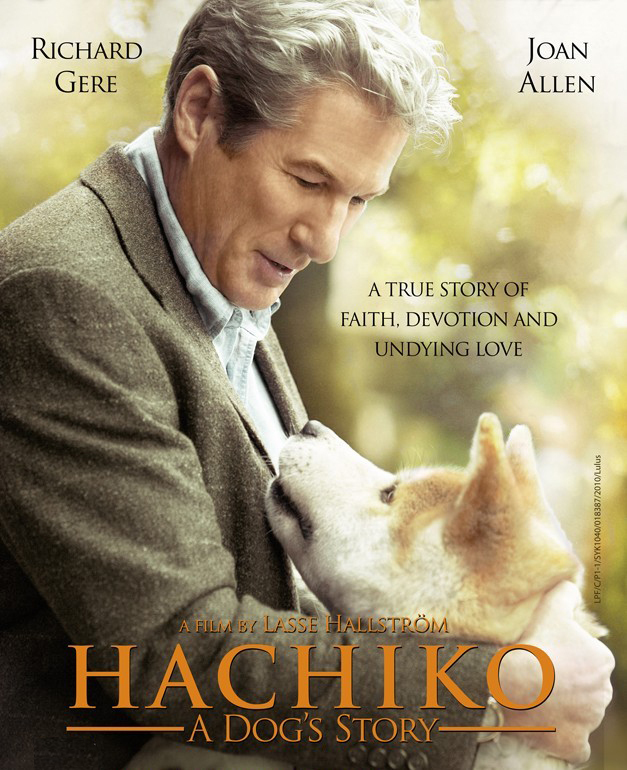 As time passes, Parker's wife sells the house and Hachi is sent to live with her daughter Andy and her husband Michael. However, Hachi escapes and eventually finds his way back to his old house and then to the train station, where he sits at his usual spot waiting for his master, Parker... This continues for ten years. 10 Years after Parker's death, his wife comes back to visit Parker's grave and while returning back, she finds Hachi still waiting at the station. She gets emotional and sits next to Hachi until the next train comes. Hachi, now old, but still returns to the train station at night and for the last time closes his eyes... to have visions of Parker.... and the two reunite as their spirits rise up to the Heaven.